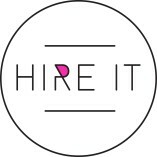 Hire iT is an innovative event furniture hire company adding a new dimension to the industry. It offers high-quality and inventive furniture to cater events for any scale and complexity. Its furniture are available at affordable prices to meet and... exceed your requirements for any type of event. Right from chairs, tables, sofas, dining tables, couches, bar to poseurs etc., you can trust this company for any type of furniture to be delivered to your destination on the same day.